Running QNAP IP cameras means that you can integrate and record security cameras from multiple brands in a single system. Which IP cameras are compatible with QNAP? How to connect IP cameras to QNAP? 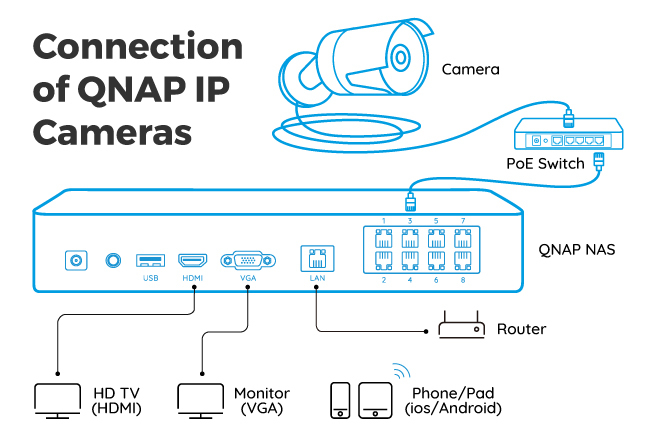 This post has covered all the answers to the questions above and if you are planning to buy QNAP IP cameras, read and learn everything you need to know! Instead of buying QNAP IP cameras in a hurry, you may get to know more about this type of security cameras first with the essential points below. Benefit 1. 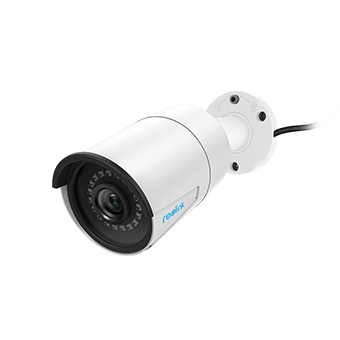 QNAP IP cameras from multiple manufacturers can work together in a single system and hence, you don’t have to worry about the security camera compatibility issues. By checking the QNAP IP camera list, you may confirm whether your security cameras are QNAP compatible or not. Benefit 2. QNAP IP camera recordings will be stored in a dedicated storage space, which ensures no data loss and no performance interference. Benefit 3. QNAP systems for IP cameras are expandable and you can develop the systems with up to 128 channels so as to run QNAP IP cameras at home, in SME or big enterprises. Limitation 1. Adding extra IP cameras for QNAP to the systems requires further fees. In general, QNAP systems offer a limited number of free security camera channels and you need to buy additional licenses for each extra camera. Limitation 2. There are multiple system models for QNAP IP cameras to work with. It could be a little frustrating for beginners to pick out the right models and you may need to ask the in-house professionals to help. QNAP IP camera setup seems to be a headache for many of you. With the detailed guide below, you are able to connect IP cameras to QNAP on your own in a breeze. To connect IP cameras to QNAP successfully, first off, you need to make sure that your computers, QNAP IP cameras and the NAS are connected to the same router in LAN. Therefore, it is of vital importance for you to assign fixed IP addresses for QNAP NAS and QNAP CCTV cameras. 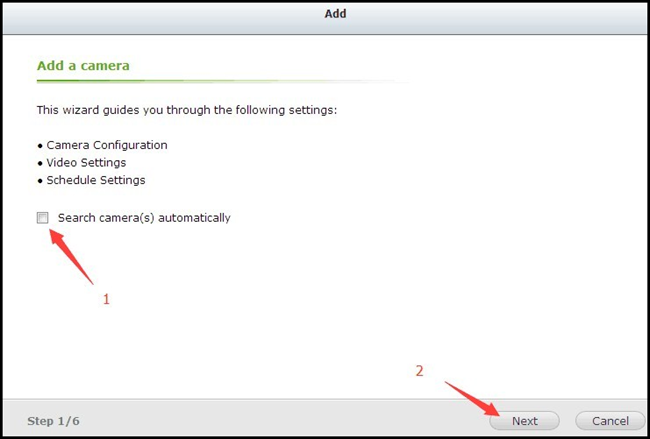 Download the software from QNAP APP Center and select Camera Configuration – Add to link security cameras to QNAP. #1. Do not click Search camera(s) automatically. #2. Fill in the information as followed and double-check the info, especially the Port and the IP addresses of QNAP IP cameras. Take Note: The Port is “8000” for most of the QNAP security cameras. #3. Select video settings in accordance with your needs. At this step, you can adjust the resolution and frame rate (frames per second) so that the QNAP IP cameras won’t take up much bandwidth and storage space when recording. #4. 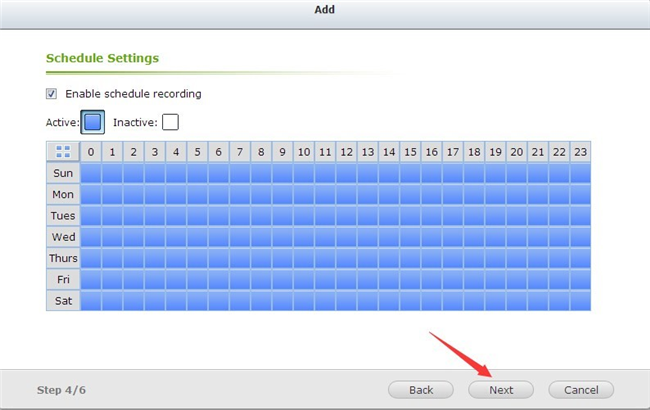 Plan your own recording mode and activate it. For example, you can set up IP cameras for QNAP to record at night only or while you are away in order to make full use of QNAP NAS storage space. #5. Confirm all the information to finish the setting. 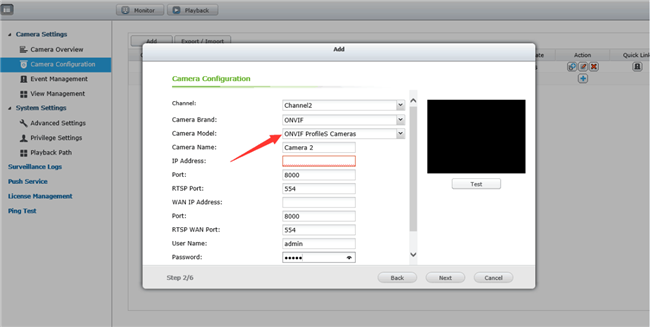 If you are able to preview videos at this stage, you have connected QNAP generic IP cameras successfully. 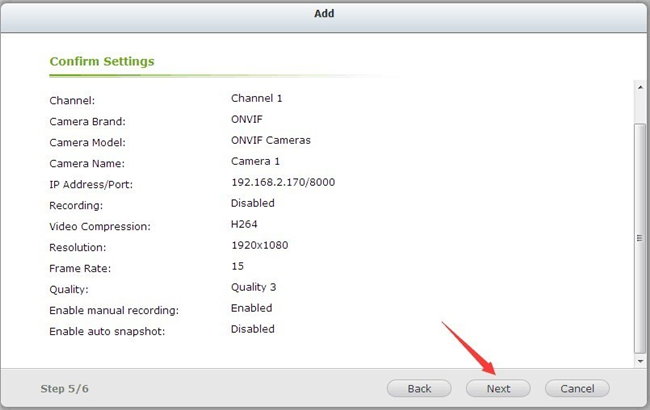 Bonus: If you want to setup motion recording of QNAP IP cameras in the system, you may check here and learn to configure in a flash. Feeling lost in front of so many options? To help you pick out the right ones, we have offered two of the best IP cameras for QNAP surveillance station as followed. Featuring sharp images, outstanding night vision and easy PoE configuration, Reolink RLC-410 is able to secure your home or business in a simpler way. 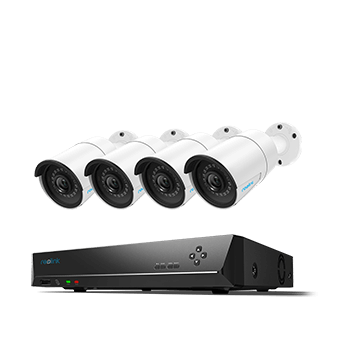 You may connect a number of these QNAP PoE IP cameras and build a more comprehensive security system to monitor your home and business with non-stop monitoring. Here is a video sample demonstrating the brilliant 5MP images of this QNAP IP camera. 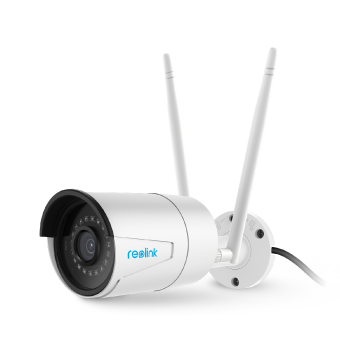 If you prefer wireless QNAP IP cameras, Reolink RLC-410W will be your ideal option with dual-band WiFi operation. Here is an unboxing video of this QNAP IP camera shared by a Reolink user in his YouTube channel. In addition to running QNAP IP cameras, you can monitor your home and business with all-in-one security solutions, which may free you from configuration burdens. Here are some of the solutions. Generally speaking, a set of IP camera systems, like Reolink RLK8-410B4, come with several security cameras and an NVR of certain channels. By connecting the QNAP IP cameras to the NVR and power both on, you are able to record these security cameras to the NVR with or without the Internet. These scalable security camera systems, with unlimited licenses, allow you to add or remove security cameras freely. Moreover, some top security system manufacturers also offer free software for you to watch live view and play back recorded videos. Phrased differently, you don’t have to spend money on additional QNAP IP camera licenses if you have applied these security camera kits. Supposed that you are running a small amount of IP cameras for QNAP to monitor your renting rooms or camping sites, you may record the security cameras to SD cards locally or upload the recordings to FTP servers or Cloud. 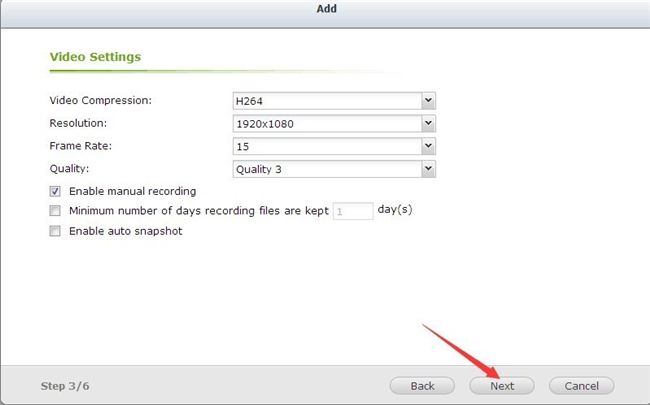 By doing so, you don’t need to purchase QNAP NAS for IP cameras and their licenses. Running IP cameras to use with QNAP can be a challenge for beginners. We have collected some of the most frequently asked questions from different forums and offered our solutions as followed. Question 1. Can I Connect a Monitor to My QNAP NAS NVR for QNAP IP Camera Live Views? You can directly connect the QNAP NAS NVR for IP cameras to a monitor with an HDMI or VGA cable. In this way, you are able to enjoy multiple live views of QNAP IP cameras and configure the security cameras effortlessly on a screen without accessing web browsers. You need to confirm which type of cables, HDMI or VGA, your QNAP NAS NVR enables and also prepare a mouse first. Also remember to power on the monitor and you are ready to view the QNAP IP cameras on a local monitor. Question 2. How to Make the Most of QNAP NAS Storage Space? This is quite similar to saving CCTV storage space. Feasible solutions include applying H.264 QNAP IP cameras and adjusting their recording modes to motion recording. Moreover, you may lower the FPS of the QNAP home security cameras so that they won’t take up much bandwidth and storage space. Having more ideas of QNAP IP cameras? Share your opinions with us in the comment below and we would love to hear! This entry was posted in Home Security FAQs and tagged camera footage storage, QNAP, security camera viewers, third-party compatible.